Colleen Thomas, 46, New York City. Colleen Thomas is a New York based choreographer and performing artist who began her professional career with the Miami Ballet and went on to work with renowned contemporary choreographers such as Nina Wiener Dance Company, Donald Byrd/The Group, Bebe Miller Dance Company, Bill T. Jones/Arnie Zane Dance Company, and The Kevin Wynn Collection among others. In 1997 a creative collaboration with Bill Young evolved into a company focused on rigorous physicality and dynamic partnering. Their work has been seen throughout the U.S, Europe, Asia, and South America. Now interested in focusing on illuminating her vision of contemporary work, Thomas has formed ColleenThomasDance. Thomas has presented her work in Hong Kong, Brazil, and Paris and in New York. Thomas received her BA in psychology from SUNY Empire State College and her MFA in Dance from University of Wisconsin in Milwaukee. Currently an Associate Professor of Professional Practice at Barnard College of Columbia University. What motivated you to deal with the subject of sexual discrimination in your art? My recent work has taken a more political stance. It has become important for me to try to make a change in my small world through dance, rather than only communicating something personal or showing an abstract world on stage. I think it is my age and my children that make this so important to me at this point in my life. In Her(e) Again Untitled the dancers and I were engulfed in the sexual discrimination cases that were being discussed all around the country. I usually create work in a very collaborative way with my dancers and there was no way to get around what was happening in our world at that point in time. We spoke about equality, societal pressures, fears, and other issues that relate to the female human condition. We put our voice, our experiences, and our politics on the stage in hopes of continuing the dialogue with audiences and finding some kind of justice and peace in our own world. I chose both my submissions because they deal with equality and the strong desire to be heard, understood, and valued as a human being. Here is a link to the interview piece I made for Barnard/Columbia dances at NYLA. It was a work on the students that “subtly but powerfully tackled the issue of sexual assault” according to the writer of on our terms. I chose dance long ago or it chose me if you believe Martha Graham. I have been dancing for 42 years. It is the most communicative art form that I know. The body is universal and how we live in it so individual and fascinating to me that I will be studying it for the rest of my time on earth. Watching a dancer express with their body can make an audience member deeply live through a similar experience. The gift of watching someone pick up another, or hold another, or even slowly place their hand on a shoulder speaks so much more loudly than saying the words, ”I will pick you up, hold you, comfort you…” Dance is action, more than just the words. Three-dimensional and visceral, it is immediate and in the moment. There is nothing but the experience then and there. Dance can be invaluable for any issue. I work very collaboratively. I want the dancers to feel valued and empowered, and as invested in the work as I am. I try to remember that its not about me, but that this process is about sharing, listening and giving so that we can create something from nothing. Strong, creative and kind human beings inspire me. Bold woman artists, poets, and visual designers such as Clarice Lispector and Valie Export inspired recent works I have created. I am moved by the human condition- everything from struggle and peace to sexuality, gender, awkwardness, race, memory, loss, greed, acceptance, youth, age, politics, discrimination, corruption, rules, breaking the rules, birth, freedom….I am interested in how we experience this time on earth and how we deal with all that comes up. Feminism means gender equality. Human equality. Yes, I am a feminist. 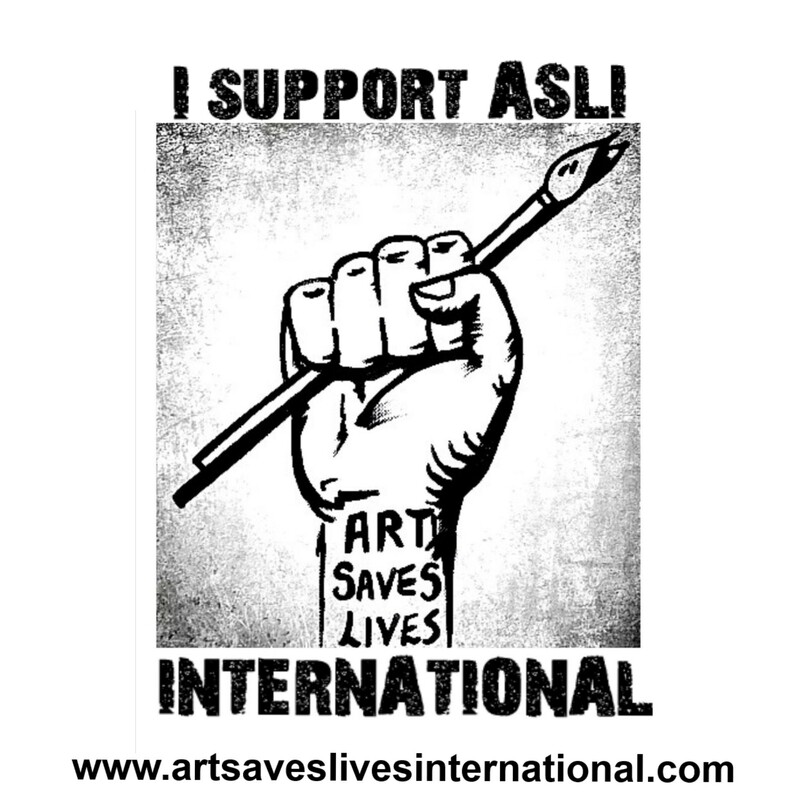 When I was introduced to Art Saves Lives International your mission moved me. I believe art can change and save lives. I have seen dance touch people’s lives through performance, therapy, and in the classroom. I feel lucky to be a woman and it is sometimes even empowering. But, women are easily objectified and women dancers even more so. Our culture -specifically American culture – knows so little about dance. Early on in my career I would get questions about whether I danced in a bar or on Broadway or whatever people associated with women and dance. There is such a limited knowledge and support for the art form in America that I have found I have to make a strong effort to educate and inspire a possible dance lover. Another challenge is this: It is documented widely that male dancers and choreographers in my field far more easily rise through the ranks, while woman who are often as talented get left behind. As there are more women in the field, the statistics are much better for a man working in dance. Women come up against and have to navigate through ageism, politics, and gender stereotypical prejudices that I don’t think men ever encounter. I have had to work to keep my voice strong as a choreographer. I think having children was a real wake up call for me; in particular having a girl. I want to model the feminine potential for her. That said, I still think women have to work twice as hard to accomplish what they want. No. Woman and men are not equal. We see horrific, unacceptable, extreme cases of this inequality all over the world. I’m lucky to have been born into my situation. I choose to live in New York City where I believe issues of discrimination- gender, sexual, and racial are not as overt as other parts of America. But, inequality is still prevalent here. I experience it in the dance world, in academia, and in everyday life. Art has saved my life many times. Art makes you experience the world more fully and in multiple ways. It can be as simple as helping someone see a different perspective or point of view or as complex as building new synapses and connections for movement in the brain. I have only recently felt the strong desire to bring about greater change with my work. I have always been interested in considering and connecting with my audience with my work. But as I get older and raise my children, I feel a new motivation to speak directly and connect more deeply to the audience in the work I create, as well as through activities such as community work, post-show talks, and open workshops. I want to move – whether it is subtly or grand- the audience and I want to be moved by the experience of the collaboration with everyone involved. My next work is a continuation of the questions that I have only begun to address in Her(e). I’m interested to further address how women are objectified and how we move/struggle with and through obstacles placed in our paths as well as unconscious constraints already set in place. When I began this research, I was looking at it from a white female perspective and honestly focusing on white male privilege. It has become important to me at this point in the work to look at the African American male and how he is similarly objectified in a much different way. Next Brazilian performance artist Agatha Brum tells us how art helps her understand her place in the world.